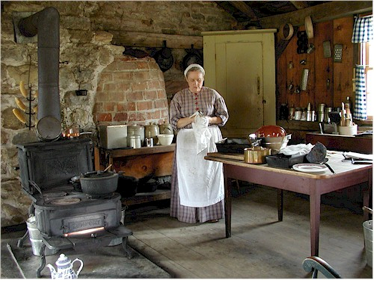 I visit many historic homes and museums and most of them have restored kitchens set up as they would have been, depicting whatever period and station in life of the family represented. As I look over the exhibit I often think about who the family was that lived in this house, what were they concerned with, how old and how many were their children, did they even have any children? What stories would they tell to us if we had the ability to hear the conversations around that kitchen table. I think I feel this so personally because of my own history of growing up in two historic houses with great kitchens that were the center of life for our large family. So many of our memories are centered in the kitchen—coming together to celebrate or simply being together around a convivial meal is the stuff that gets us through tough times. 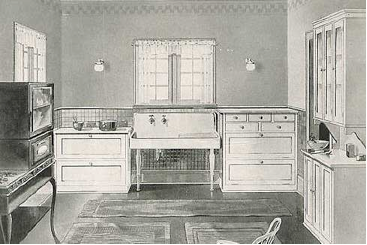 All families have their own styles, but the kitchen is where most family traditions begin. Whether it is a favorite requested meal your mom made for you on your birthday or when you get home after a really bad day the crockpot is there on the counter holding something ready for dinner—you hold on to the traditions that worked personally for you, and discard the rest. I am from a family that does EVERYTHING around food.We use it to celebrate and comfort.Coming from a large family of seven, I think that because our mother had to come up with inexpensive,hearty meals that fed five children with leftoversmy mother (we called her “Moo”) would cook with an eye towardsomething that we would eat with the least amount of fuss.It also would have to be reincarnated into something that could stretch to another meal or lunch for us.We lived in a very old (1780) house that had a huge hearth, and though it could probably still be used for a fire, had an electric range placed inside. We had simple celebrations and our birthdays were centered on my parents putting penny candy in a brown bag and hanging it from the branches of our apple tree. We screeched and yelled in excitement as the birthday boy or girl got the first crack at the swinging bag with a cutoff broom stick. Even when my father was lost in a car accident in the early ‘70s, the atmosphere about the large house(we moved to a very large house in Shepherdstown eight years earlier) was still much like a party instead of a wake.My dad had a great sense of humor and was very witty and the house murmured that day with his friends and students retelling many stories about him.The dining room had many beautiful stained glass windows, and I remember the look of the sun shining through them onto the large dining table gleaming with all the dishes the neighbors brought—all given in love and kindness in the tradition I grew up with. Many more stories could be told of all the celebrations that my family has had over the years and the meals now are even more important to us as we gather without our beloved parents. Right before Moo died we were blessed to have her live with us and one evening her nurse wheeled her into the kitchen to sit and watch me make dinner. She loved to watch me cook, a pastime she missed very much, and she did not hesitate to let me know that I should “turn down the fire under the chicken” or add more seasonings to whatever I was cooking. This particular evening I remember (in retrospect it turned out it was right before she died ), she sat watching me move around the stove and suddenly she loudly called to me raising her glass with her nightly drink, and said, “Louise, do you know what the great thing about being terminal is?” Puzzled and a little horrified I responded “No, Moo what is it?” She threw back her head and laughed heartily saying, “The great thing about being terminal is that your green vegetable for the day can be the olive in your martini!” Her nurse slid out of her chair laughing and through my watering eyes Moo never looked more gorgeous. She soon quietly died in her small little room filled with windows and sun and we still call our family room “Moo’s room,” but the kitchen is where I remember her the most and on a regular basis I wish that I could “channel” her grace and kindness that she showed to everyone she met, and her ability to make any leftover into a meal fit for kings or more importantly her beloved children. As I have often mentioned, your historic house has had many memories formed within its walls. You really need to be aware that you have the opportunity to make memories with your children, friends and family. To this day, I cannot get myself to paint over the Doxology a friend painted for me in the kitchen after Moo died. My friend had performed a really profound act of kindness and comfort for my 45th birthday by painting this around the ceiling of the eating space in my kitchen. She was inspired by hearing me say that I was reluctant to attend church because I could not seem to get through the offering without crying as I had such a vivid memory of my mother in church, and for some reason the opening bars of the Doxology always made her seem so close. So one day I came home to find this beautiful hymn painted around the perimeter of the kitchen eating area, and now everyday Moo is there at my table. Make your own families memories in your kitchen. Now more than ever, our families need to connect in a space that binds them with memories and traditions that are part of their family’s customs and history.